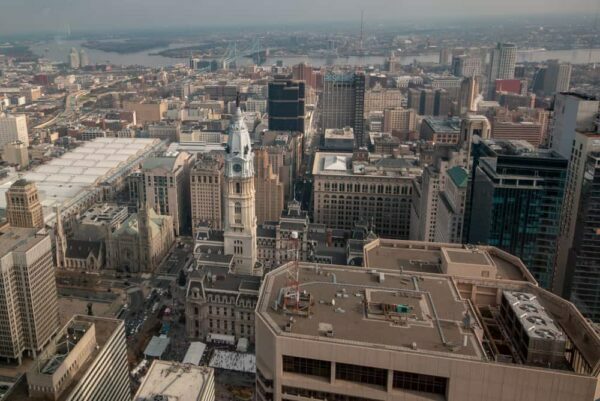 If you want to get a bird’s-eye view of Philly, there is nowhere better to visit than One Liberty Observation Deck. 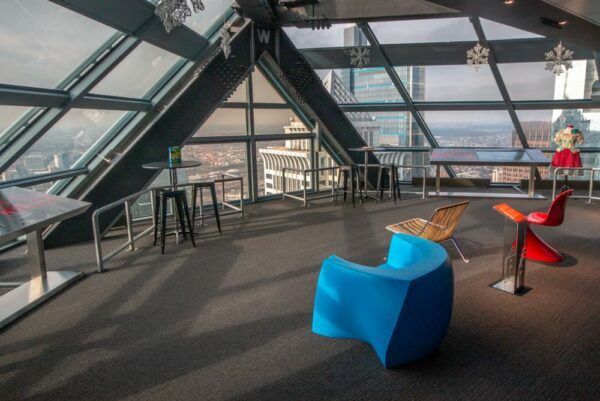 Located in Center City Philadelphia, this observation deck offers 360-degree views from the top of One Liberty Place, one of the tallest buildings in the city. 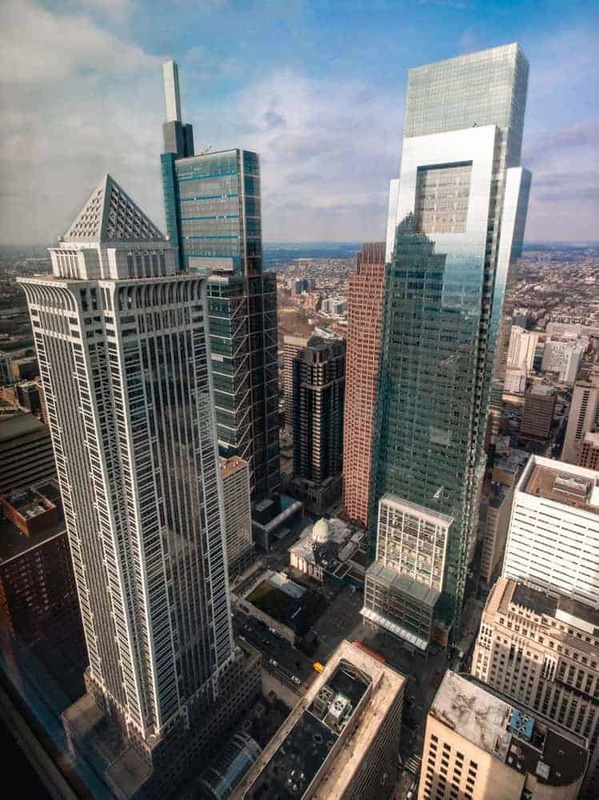 Despite being the fifth largest city in the country with several impressive skyscrapers, Philadelphia never had a true observation deck aside from the one at City Hall until November 2015. There are binoculars at the top to get a closer view of Philly from above. 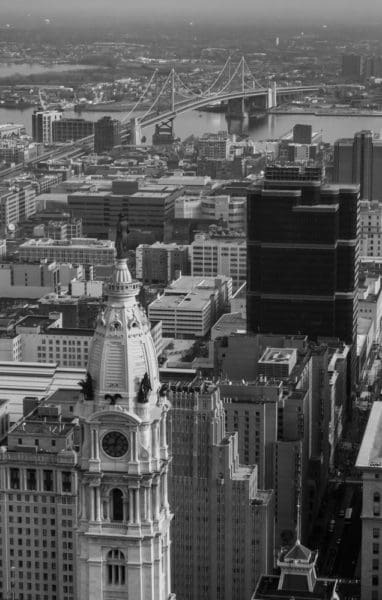 The observation deck at City Hall had a few problems, though, that made it not ideal for such a large city, despite having great views just below the feet of William Penn. First, since you’re standing atop City Hall, you can’t see this iconic building when looking at the skyline. Secondly, the deck is only open weekdays during normal business hours, making it hard for many to visit and limiting the possibility of great sunset or nighttime shots. Lastly, due to the size of the observation deck, visits are limited to four people and only around ten minutes per visit. 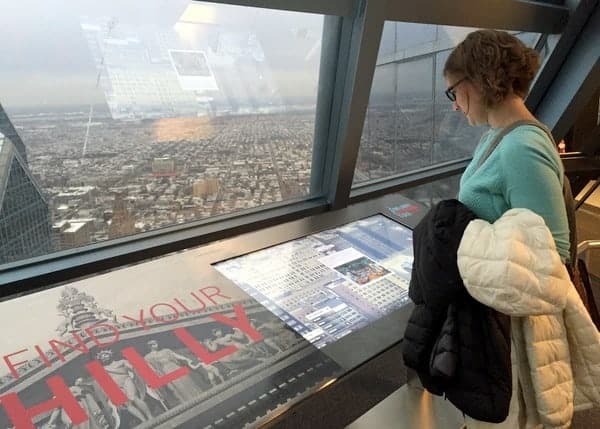 And, while I still would recommend a visit to the top of City Hall for the great view, unique history, and inexpensive price, the One Liberty Observation Deck fills a much-needed spot in the city’s tourism landscape. From the One Liberty Observation Deck, you can see the iconic Philadelphia City Hall. 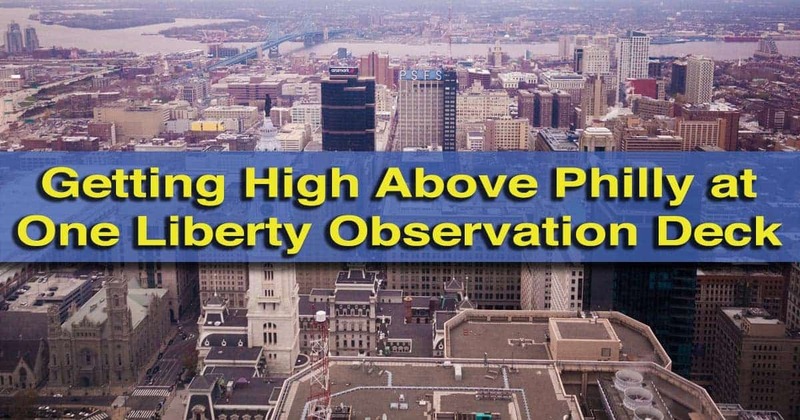 Fortunately, Philadelphia’s observation deck drought came to an end a few years ago when the One Liberty Observation Deck opened. 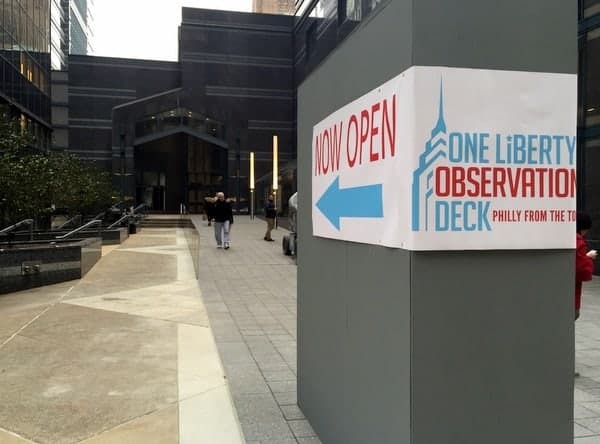 The entrance to the One Liberty Observation Deck is off Market Street, less than two blocks west of City Hall. The ticket counters and elevators to the top are located on the second floor of the building. The entrance to the One Liberty Observation Deck is from Market Street. 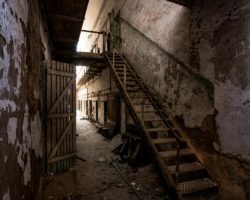 In addition to the ticket counter and the elevator to the observation deck, the second floor also features a gift shop with nice Philadelphia-themed souvenirs. To get to the top of the building, follow the line past the feet of a 900-foot tall Benjamin Franklin to the waiting elevator. 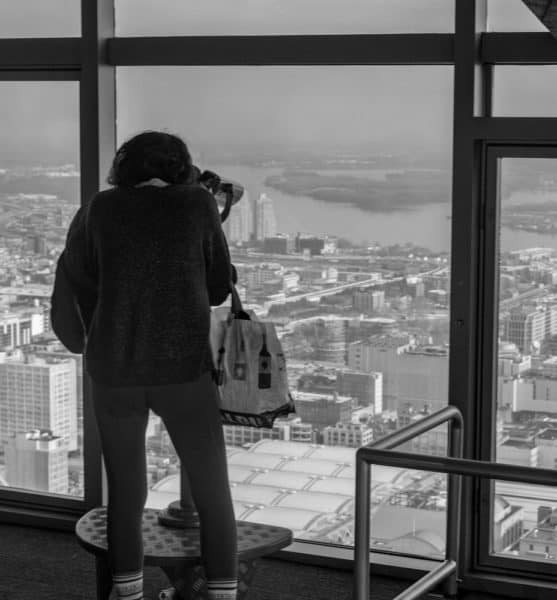 If it’s a busy day, there may be a wait for the elevators, so keep that in mind when you figure out how much time to spend at One Liberty Observation Deck in Philly. Once it’s your turn to ride the elevator, the trip to the top, 56 stories above you, takes roughly 70 seconds. A large bust of Benjamin Franklin greets you at the top of the building. During this time, a short video plays on the screen above the door. While it is nicely done, I would have liked to have seen something a bit more interesting, maybe with a few facts about the observation deck and the city. 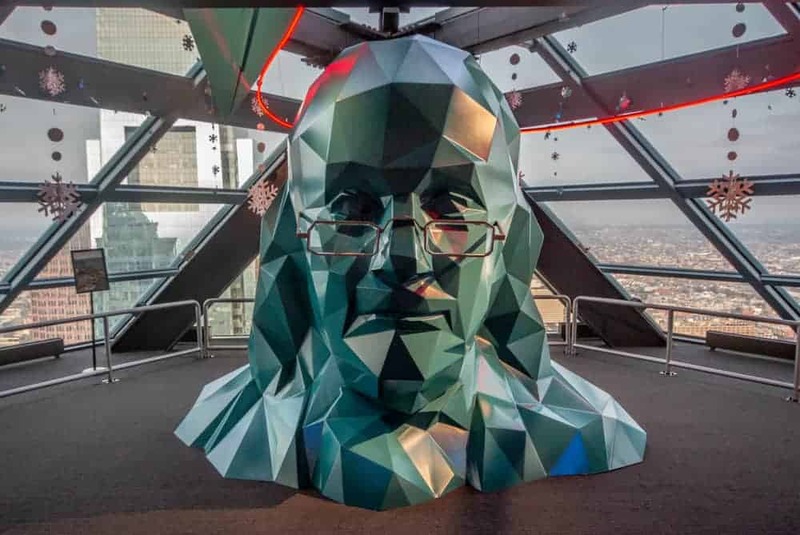 As soon as you stop out of the elevators, you are greeted by a giant bust of Benjamin Franklin (directly above his feet far below you) and an imposing view of Philly. The One Liberty Observation Deck occupies the 57th floor of the tower and is the highest publicly accessible spot in Philadelphia at 883 feet above the streets below. Great views abound from One Liberty Observation Deck. The observation deck itself is nicely designed, but relatively sparse. Of course, with a 360-degree view from the windows, that likely doesn’t matter. However, don’t expect a cafe or shop at the top of the tower like you find in many other observation decks. Here, the view speaks for itself, and what a view it is! 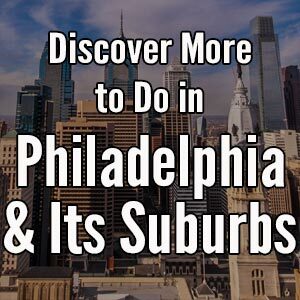 On a clear day, you can not only see all the sights of Center City, but many miles in every direction. Unfortunately, many of the buildings of Old City, like Independence Hall, are blocked by other buildings, but if you look closely, you can just make out the steeple of Christ Church, the tallest building in the United States for over 55 years. The floor is sparsely decorated, but offers plenty of room to enjoy the view. It’s also impressive looking down at Philadelphia’s City Hall, especially when you realize it was the tallest building in the world from 1894-1908. Next to several of the viewing areas are large touch screen monitors. The monitors allow you to move around the city to see a closer view of some of the city’s landmarks. You can even zoom in on the map and many buildings have icons where you can learn more about them. This is a great touch that helped me to pick out several points of interest on the city’s skyline. The touch screen monitors give information about the city and help you find local landmarks. Also in One Liberty Observation Deck are several listening areas that give you a bit of history about the city. While these are neat, especially the replica Flyers’ penalty box, I’m not sure how much they add to the experience. Nevertheless, they are well done if you want to learn more about the city’s sports and music history. If you’re going to go, I’d recommend a clear weekday. Weekends can be very busy here, especially during the summer, and the shape of the room means that the best viewing spots will be at a premium. Looking out over Center City, Old City, and into New Jersey. Going on a nice day ensures that you’ll get the best possible view. While I’ve been up in One Liberty Observation Deck twice, neither time offered the ideal view due to weather. However, I can attest that even on a cloudy day, the view from the highest accessible point in Philadelphia is still quite impressive. While at the observation deck, take one of the free tours offered on the hour every day between 11a and 6p. 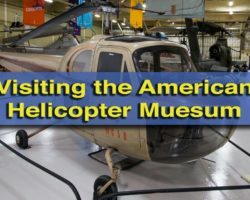 These tours give you a chance to learn more about the city, and the guides point out various places of interest that can be seen from the observation deck. 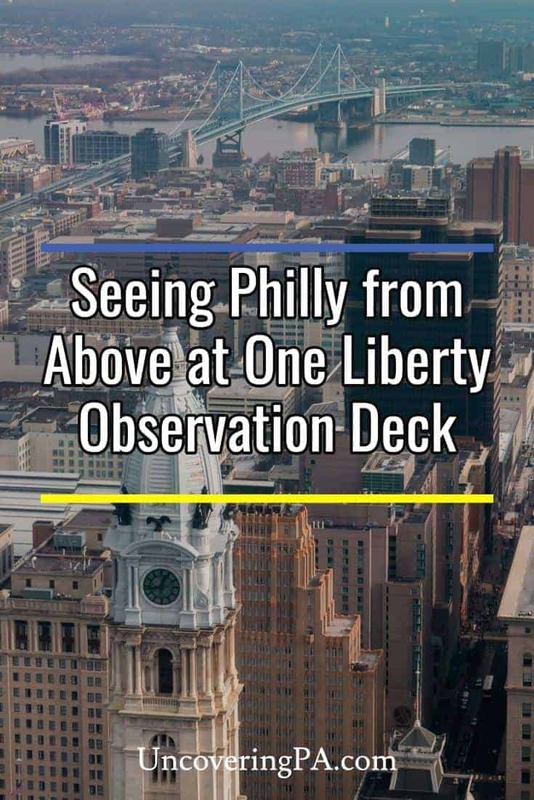 Overall, I really enjoyed my visit to the One Liberty Observation Deck. While it is fairly basic, the real highlight of any observation deck is the view, and I think any sort of shop or cafe would have distracted from the experience. If you want to visit a Philadelphia observation deck during your time in the city, don’t hesitate to visit One Liberty Observation Deck. Note: My visit to One Liberty Observation Deck was hosted by the facility. However, the opinions expressed are my own. 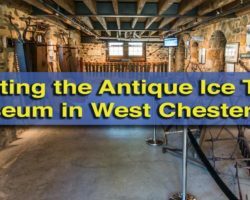 Looking for more to do in the area? 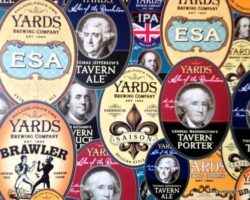 Check out our favorite photo spots in Philly and our suggestions for how to spend a weekend in Philadelphia.